Disneyland Resort is the land of Mickey Mouse, princesses, and churros. Okay, maybe that’s not an official designation, but churros are a quintessential part of the Disneyland experience. With so many from which to choose (and even more available during Pixar Fest! ), there’s a churro for everyone! Our Disneyland correspondent, Heather (check her @DiningInDisney on Instagram! 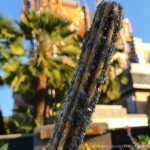 ), is always up for a new churro, and she brings us the Pineapple Churro today! She picked this up from the churro cart in front of Sleeping Beauty Castle. 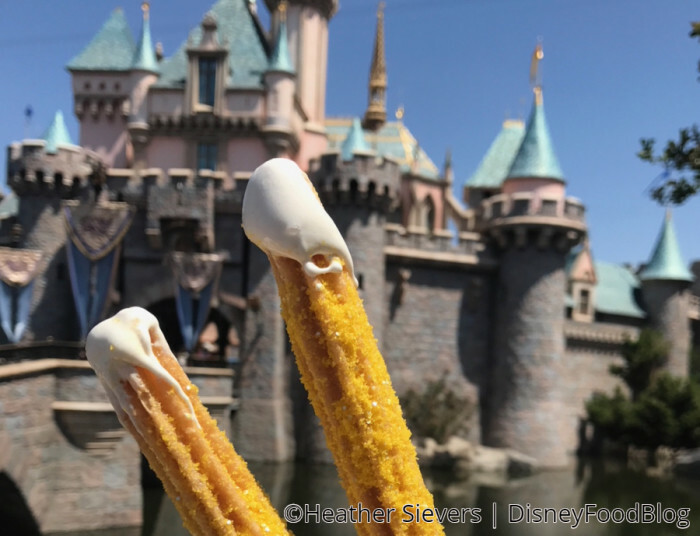 This super bright yellow churro is dusted with pineapple-flavored sugar, which Heather reports has a stronger smell than it does flavor. But the pineapple flavor is still noticeable and enjoyable. 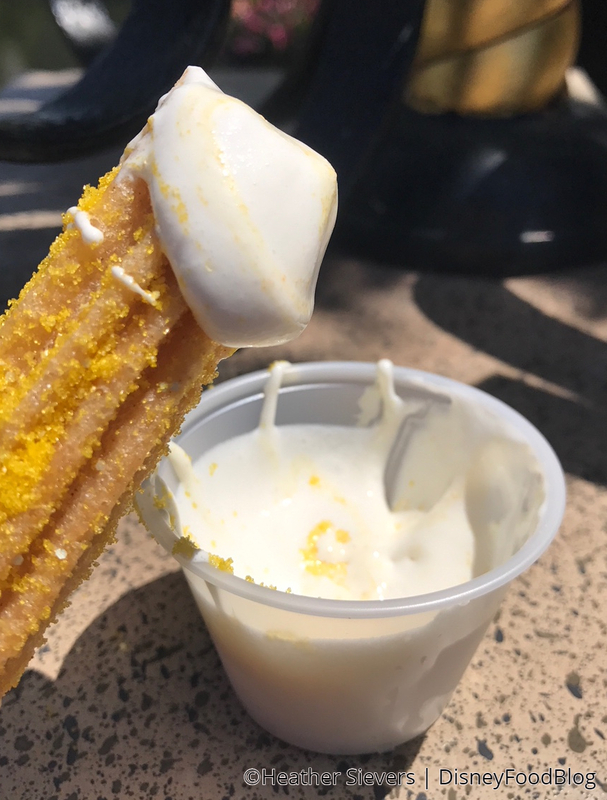 The churros also come with Marshmallow Dipping Sauce, which basically means marshmallow fluff out of a jar. But we’re not hating it! Heather wants to be clear: this is not a Dole Whip churro, despite the pineapple flavor. 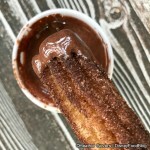 But it’s a yummy addition to the Disneyland churro world! Ahhhh, Disneyland churros, we love you. And we’re always game to try some new iterations of these crunchy sticks of fried batter. 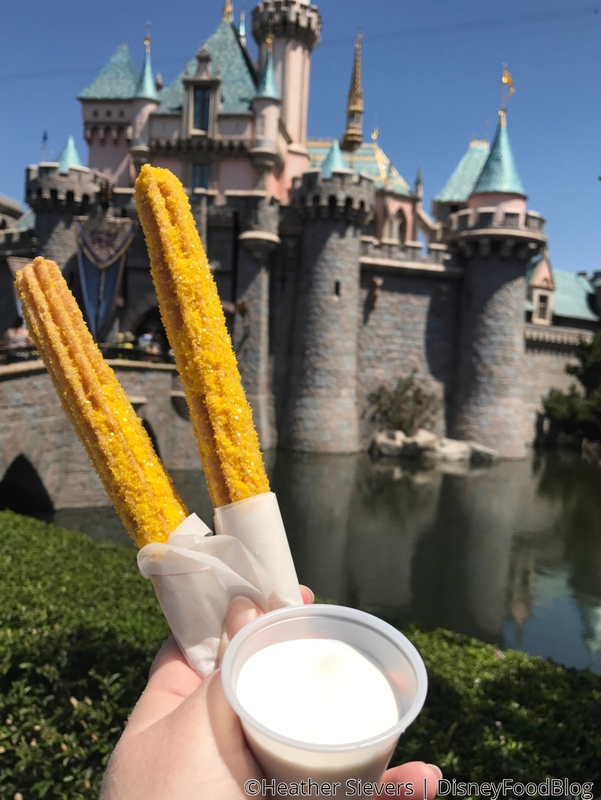 Want to know more about the Pixar Fest Churro Challenge? Check it out here! 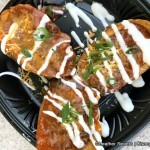 Check out more Disneyland Food Reviews Here!! Heather Sievers is DisneyFoodBlog’s Dining in Disneyland columnist! Check out more of her adventures at @DininginDisney on Instagram! 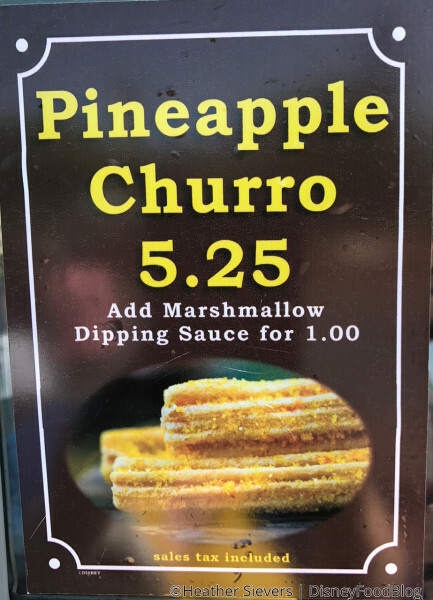 Are you in for some Pineapple Churros? Let us know in the comments! 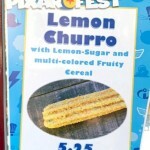 Pixar Fest Eats: Lemon Churros at Disneyland Resort! New Eats at Golden Horseshoe and Stage Door Cafe at Disneyland Resort! 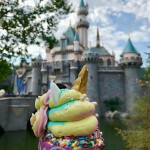 Rainbow Unicorn Cupcake at Disneyland’s Jolly Holiday Bakery! Review: Galactic Churros at Disney California Adventure Park’s Summer of Heroes! « DFB Video: Best Disney DONUTS! I really want to try this dipped in a dole whip.